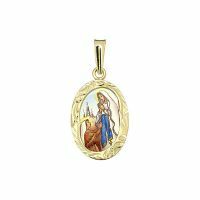 The shape of our Oval Catholic medals is ideal for standing figure of a patron saint or for Madonna. The solid gold frame ofeach religious medal protects medallion against mechanical harm and its luster evokes a brightness of glory. Each 585/1000 gold and hand painted ceramic medallion is sold in a luxury box with a certificate of origin and quality of jewelry enamel.